Everything we do is guided by our core values; integrity, fairness, trust and inclusivity. 1. Information about your device: This includes details of your device such as the browser type, unique device ID and IP address (a numerical code to identify your device that can provide information about the country, region or city where you are based). 2. User profile: We collect information when you create your VC4A account. This includes your name, email address, login name and password. These are the only required pieces of data we ask for in order to create your account on vc4a.com. When you register a vc4a.com account, we assign you a unique ID number that we use to recognize you when you are signed in to our services. This will recognize you if you sign in using the same account on a new device or through a different application. You may choose to provide additional personal information such as your date of birth, gender, city, country, areas of expertise, links to external profiles (for example, LinkedIn or Twitter), your photograph and a brief biographical statement. This data is entirely optional and not required to make use of our services. You may also choose to post brief updates that appear on your user profile page or comments on pages created by partners and other organizations. We do not collect special categories of data—such as information about your political opinions, religion, race, health or sexual orientation—unless you have chosen to provide that information to us. 3. Organizational profile: We collect information when you create a partner page, organization page or venture profile. This may include the organization or venture name, a profile image, address, relevant sectors, markets, country focus, stage of the company or organization, staffing, type of clients it serves, founding date, revenue, staffing, current financial needs, financing history, shareholders, program participation and status updates. This information is voluntary and may be updated or deleted at any time. We have implemented appropriate technical and organizational controls to protect your personal data against unauthorized access and against accidental loss, damage or destruction. You are responsible for choosing a secure password when we ask you to create a password to access parts of our sites or apps. You should keep this password confidential and choose a password that you do not use on any other site. You should not share your password with anyone else, including anyone who works for us. Unfortunately, sending information via the internet is not completely secure. Although we do our best to protect your personal data once with us, we cannot guarantee the security of any personal data sent to our site while still in transit and so you provide it at your own risk. 1. To provide the products or services you sign up for, such as subscriptions to investor or research accounts. We also use personal data for related internal administrative purposes—including accounting and recordkeeping—and to make you aware of any changes to our services. 2. To send communications such as newsletters when we have your permission, or when permitted by law. 3. To personalize our services (for example, so you can sign in), remembering your settings and recognizing you when you sign in on different devices. 4. To improve our communications, we use technology similar to cookies to confirm whether you have opened a newsletter email or clicked on a link in the email. 5. For statistical purposes such as analyzing the performance of our sites and apps and to understand how visitors use them. 6. To respond to your queries and to resolve complaints. 8. To comply with applicable laws and regulations. 9. To aggregate anonymous financial data with the goal of providing insights into larger trends, with tools such as the VC4A Index or VC4A API. 1. If you are attending one of our events hosted by an event partner, we may share your personal data with that partner for event administration purposes. 2. We share your data with other organizations that provide services on our behalf such as online payments and other forms of payment processing. When you purchase a service from vc4a.com, your personal information, including your name, address and credit card details, are securely transmitted to our payment processing partner Authorize.net. Your credit card details are never stored or made available to anyone on vc4a.com or anyone who works for us. 3. We may reveal your personal data to any law enforcement agency, court, regulator, government authority or other organization if we are required to do so to meet a legal or regulatory obligation, or otherwise to protect our rights or the rights of anyone else. When you register for an account with vc4a.com, you have access to a profile page. Under “Edit profile” you can review and change what information is public, visible only to VC4A members or only to you. You can also update your information, delete information or provide extra information if you want. We also provide a mechanism to download all of the personal data collected by our sites. This includes articles contributed by you, profile details, activities (such as participation in programs), pages and progress statuses. You can access this by using the “My data” link in your profile. You may also update your email communication preferences in the “Email notification” tab in your account. This includes opting out of all email communications from vc4a.com. Finally, we give you the option to delete your vc4a.com at any time. This not only deletes your user profile data but all pages and content associated with your account. This data is immediately deleted from our database and, within a period of time specified by law (see Our adherence to GDPR guidelines, below), permanently deleted from data backups we create to ensure continuity of our services. 1. Keeping you signed in. 2. Understanding how you use our site. 3. Showing you content, products and services that are relevant to you. When you sign in to our sites or apps using your Facebook login details, for example, you give permission to Facebook to share with us your email address and certain aspects of your Facebook profile if you have made this public on your Facebook profile. This only includes your first and last name, link to your Facebook profile and profile picture. We do not have access to updates on your Facebook profile. If you use your Google login details, you give Google permission to share the information that you have made public in your Google profile. This only includes your first and last name, your email address and whether your email address has been validated, a link to your Google profile and, if you have one, your profile picture. We will then use this information to form a profile for your vc4a.com account. If you remove VC4A from your Facebook, Google or LinkedIn settings, we will no longer have access to this data. However, we will still have the information that we received when you first set up your VC4A account using your Facebook, Google or LinkedIn login. We follow a standard technical procedure of using log files on the servers responsible for hosting our sites. These files record data such as requests made by visitors when they access our sites, performance metrics, errors and so on. The information collected by web server log files include internet protocol (IP) addresses, browser type, a date and time stamp, referring and/or exit pages and resources requested by a visitor’s device. These logs are not linked to information that is personally identifiable. The purpose of the information contained in these logs is for administering our sites, and for providing quality and continuation of service for vc4a.com and its related apps and services. Anonymous data stored in logs is deleted as soon as it is no longer required for achieving the purpose for which it was recorded. With respect to data being recorded in order to provide a services to our visitors, the data is no longer required as soon as each respective visitor session ends. In accordance with GDPR regulations, data stored in log files is deleted ten days after it was recorded. Subsets of data may remain on record for diagnostic purposes only. If so, visitors’ IP addresses are deleted to make identification of the accessing client impossible. We retain your personal information only for as long as is necessary for the purposes set out in this policy. We will retain and use your information to the extent necessary to comply with our legal obligations and resolve disputes. 1. The right to access, update or to delete the information we have on you. 2. The right to be forgotten. 3. The right of restriction. 5. The right to withdraw consent. 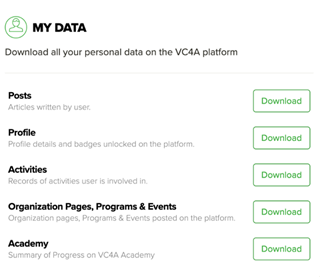 Under the GDPR, vc4a.com is a data processor with regard to the registration of user and organization profiles which can be deleted by the user at any time for any reason. We are also a data processor with regards to processing and storing application forms on behalf of third parties. VC4A does not process or use the data itself without explicit consent from the user filling in the application form. Under GDPR Article 17, the right to be forgotten, we have an automated pruning process that deletes all application data after thirty-eight (38) months. Any data added to the vc4a.com website directly, such as user data and venture profiles, may be altered (Article 16) and fully removed (Article 17) from our sites. We also give users the ability to download all of their data from the vc4a.com website, under Articles 15 and 20, GDPR data portability.